Our visit to Miss Frank was very impromptu - I'd come home from the gym one Saturday morning feeling quite hungry and with not that much in the house. We had a quick look through Instagram hoping for some inspiration, and saw some particularly tempting pictures of Miss Frank on Daisy's feed. 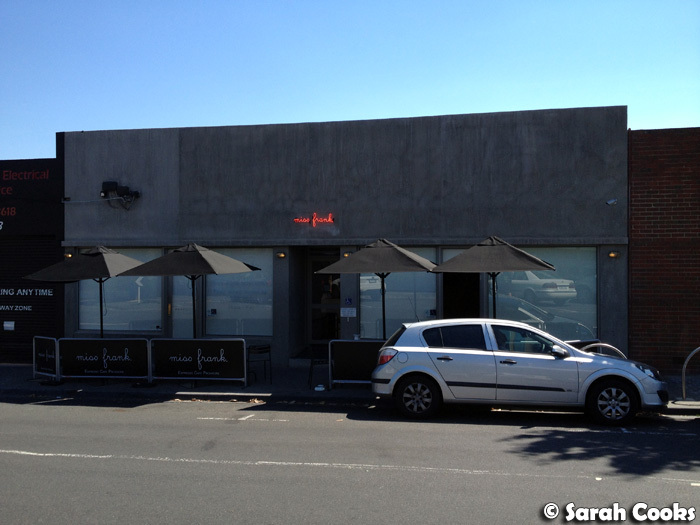 A Google search revealed that it wasn't too far, and that it was from the same owners of Espresso 3121. (An old favourite of mine from when I worked nearby). Decision made! 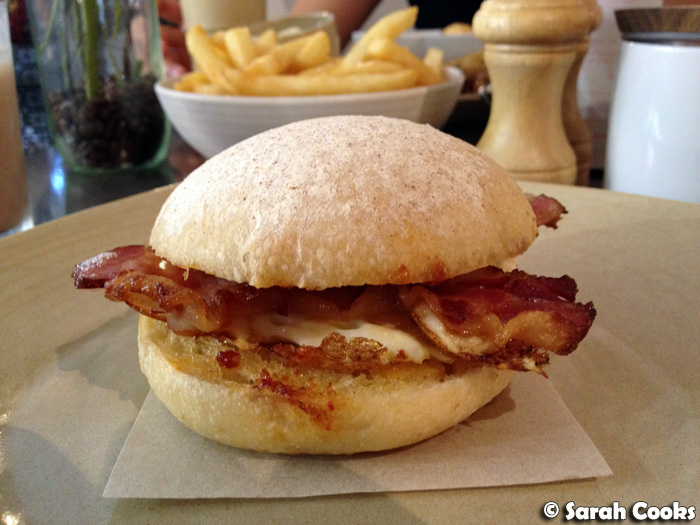 a truly excellent bacon and egg panino! Before I start the gush-fest, let me share a couple of (slightly!) negative points. I found the layout of the cafe quite confusing. As you can see in the top photo, there are three doors, and with almost all the curtains closed, I assumed that the door on the right-hand side was the entrance. However, that door leads into a general seating area and the door on the left is the proper entrance - that's where the espresso machine, baked goods and cash register are. We kinda stood around feeling a bit lost until a friendly staff member saw us and showed us to a table. The cafe is fitted out in an open-plan minimalist-chic kinda way, with stainless steel tables and bare floors. We were literally sat across from the staff lockers. (This isn't a negative point! I just thought it was interesting!) 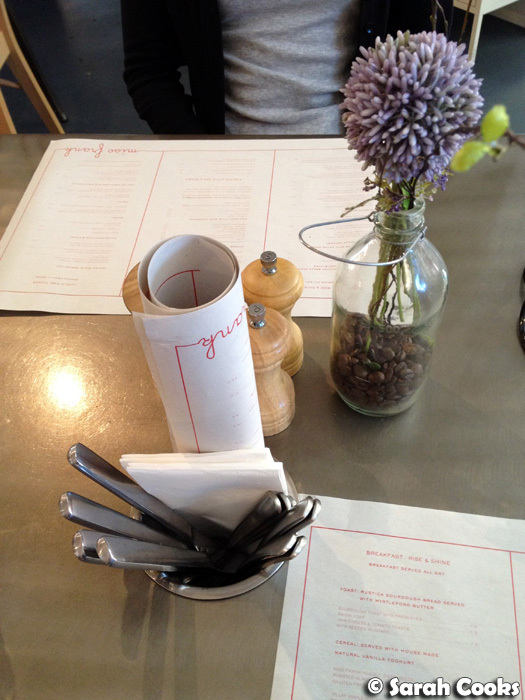 The tables had a cutlery/napkin/menu holder fitted into the centre of the table itself, which I thought looked cool at first, but quickly realised was irritating because it takes up quite a bit of table space and makes it hard to arrange your plates and cups around it. Ok, let's look at the food and drinks! 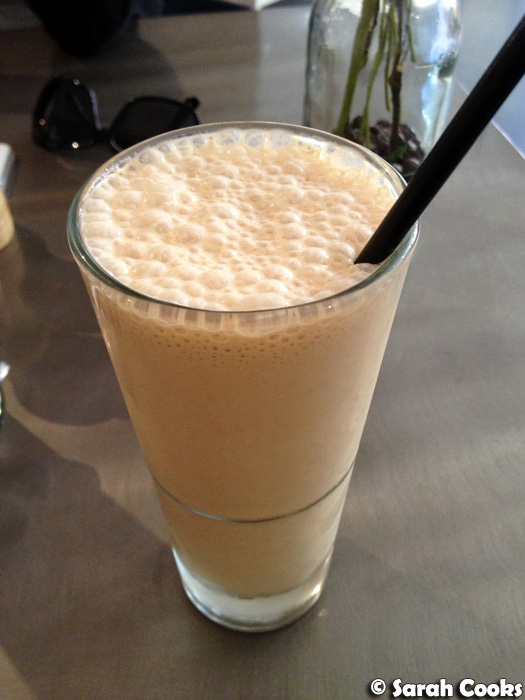 I totally loved my espresso milkshake - it had a shot of espresso (duh), milk, ice-cream and malt powder. A perfect pick-me-up for a hot day. 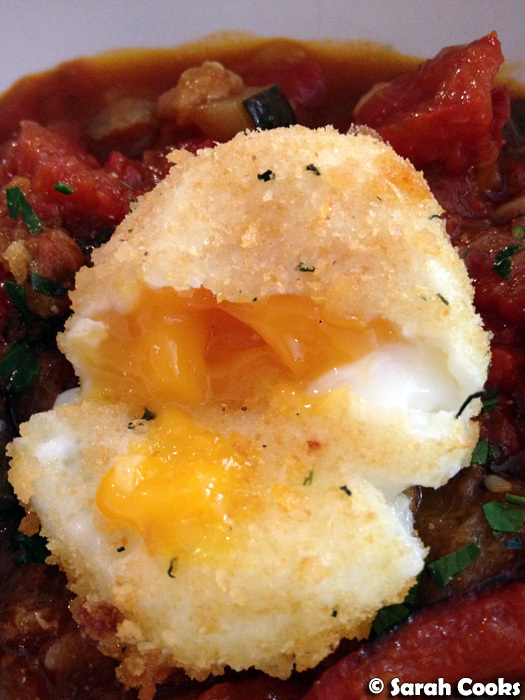 I wanted to go for something a bit healthy, and chose the ratatouille with parmesan-crumbed egg. It was overall a good dish - there was a nice balance of sour and sweetness in the ratatouille, and I loved the two varieties of buttered toast. (I also felt, perhaps a little optimistically, that I was getting lots of good vitamins from eating a vegetable stew!) The crunchy egg was a nice touch, but I must admit it didn't quite reach the heady heights of the panko-crumbed poached eggs with miso at Goldilocks Cafe. 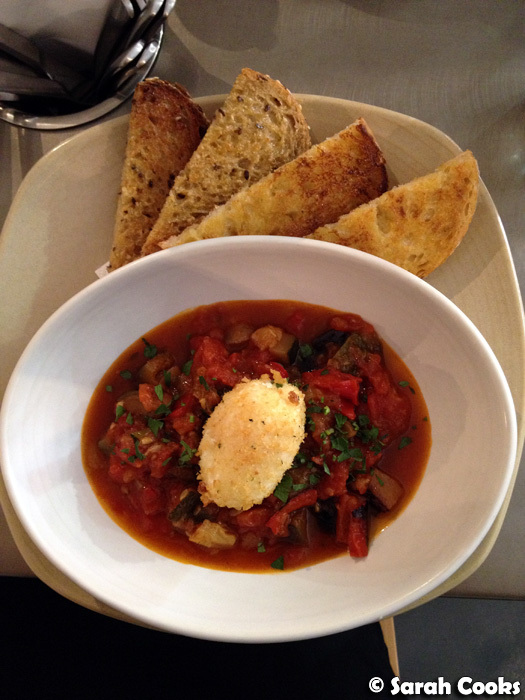 Sandra's choice, however, of a bacon and egg panino totally blew my ratatouille out of the water! (Apologies, I can't remember the exact price as it was just in the cabinet and not on the menu, but I think it was around the $10 mark). Check out that crispy chewy bacon! The bread itself was slightly chewy, and the tomato relish provided a nice sweetness. There was also a hint of garlic somewhere in the sandwich - perhaps a slick of aioli? Either way, total deliciousness! And we got chips too. They were fantastic: thick cut (woohoo! ), freshly fried and crisp. Perfect! 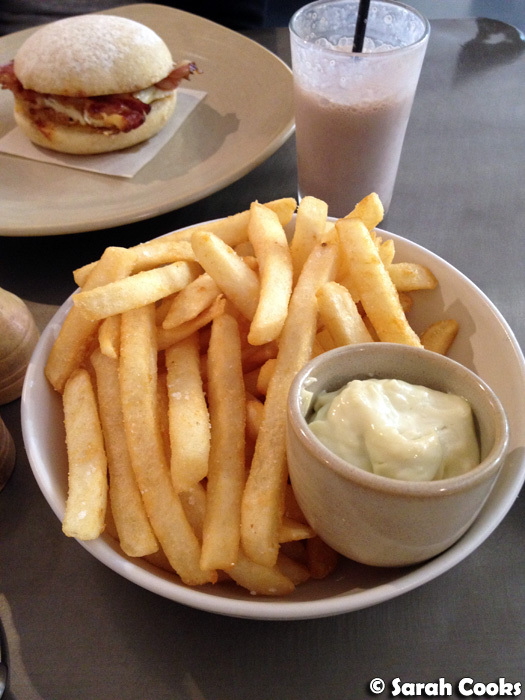 We really enjoyed Miss Frank - food and drinks were great, and being located away from the major hipster cafe enclaves (I'm thinking Fitzroy, South Yarra, even St Kilda...) means they're pretty chillaxed and friendly. The day we visited they were pretty quiet, with mainly older couples or young families. I'd definitely recommend trying them out! That bacon is perfect! It's like bacon in drawings :P And I know what you mean, sometimes you don't think that you're going to blog somewhere and it turns out to be fabulous! Looks like you ticked the three boxes I need in order to visit - will have to head there v soon. 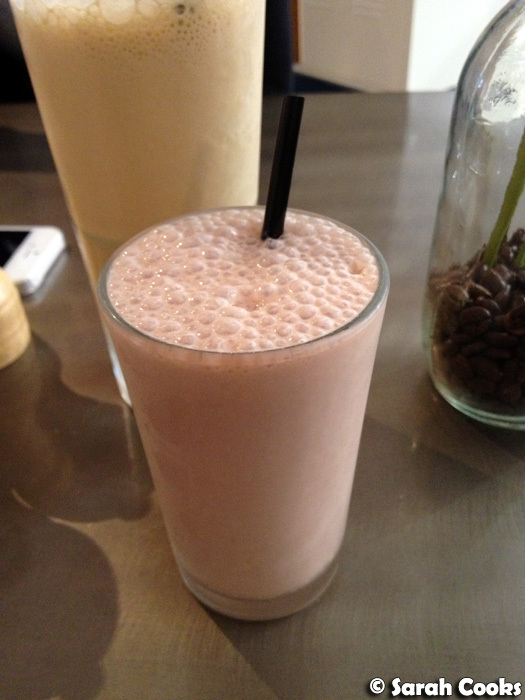 Love a milkshake! Looks great. Pity it's on the other side of town for me but it certainly looks like it would be worth the trip! Love impromptu lunch dates the most! Yum!